Lets consider we have values X and Y. In Simple word Linear Regression is way to model a relationship between X and Y , that's all :-). Now we have X1...Xn and Y , then relationship between them is Multiple Linear Regression. Linear Regression is very widely used Machine Learning algorithm everywhere because Models which depend linearly on their unknown parameters are easier to fit. Prediction Analysis kind of applications can be done using Linear Regression , precisely after developing a Linear Regression Model, for any new value of X , we can predict the value of Y (based on the model developed with a previous set of data). For a given Y, if we are provided with multiple X like X1.....Xn , then this technique can be used to find the relationship between each of the X with Y , so we can find the weakest relationship with Y and the best one as well . Why I did all the theory above is , so that I could remember the basics, rest is all easy :). 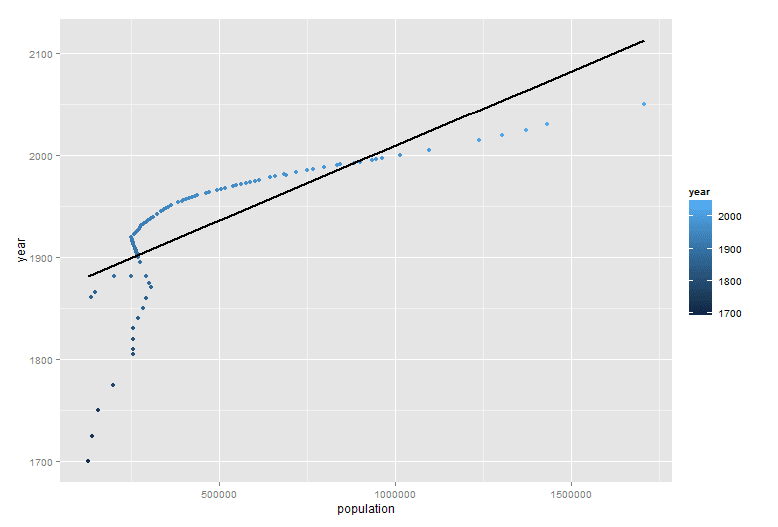 So now I'd like to do an example in R and the best resource I could find was Population. Above is just a snapshot of the data , I had data from 1700 till 2014 and yeah some missing data as well in-between . 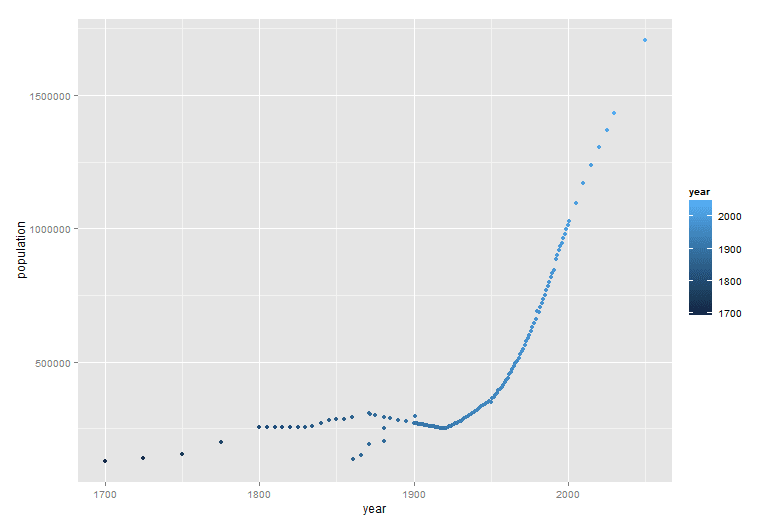 to use R , already caret package has an implementation of regression , so load the same and for plotting I am using ggplot. Looking great , its growing ,.. growing ..and .. so its real data . So now I have X and Y , or simply wanted to find the population based on year or vice versa . Don't worry , R brought caret package which already brought implementation of the linear regression algorithm. 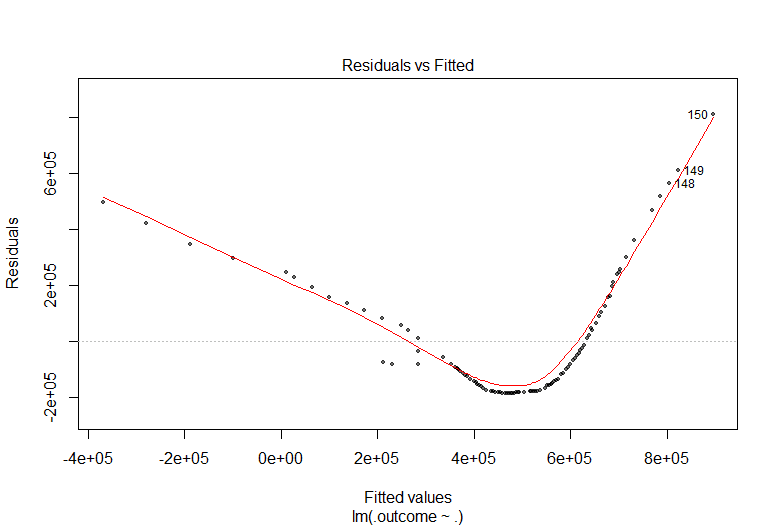 So now lets plot the fitted vs residual graph and see how well the model worked. Some weird :) but atleast the line went through almost all the data.